The history of Clounmacon Football Club is long and varied. The earliest record dates back to 1898. Clounmacon played Ballylongford on October 29th; the final score was Clounmacon 0-6,Ballylongford 1-2. In 1924 Clounmacon fielded a team, and we have found out from the records that they played in Red and green striped jerseys. The organisers of this team were Donal'' Bill'' O' Sullivan and Jimmy Shanahan. In 1925 the club was formed under the guidance of Jerry "Sonny"Buckley who was the first Chairman of the club. In 1926 July 4th, Clounmacon and Ballylongford played in a North Kerry junior league game in Tarbert. After five minutes of play the match was abandoned due to thunderstorm and heavy rain. The teams took shelter under a near- by bridge from which they had to evacuate, due to the water rising in the river. In 1927 June 29th Clounmacon played Ballylongford in Kilcolman Asdee, Ballylongford won this match. the lineout was: Mickey Carmody, Johnny Carmody, Willie Walshe, John Sonnie Sheey, Thomas Murphy, John Joe Aherne, Jimin Twomey, John Joe Conway, Jim Sullivan, Richie Lyons, Tom Cronin, Josie Enright, Jack Shanahan, Martin Moriarty and Pat Stack. There was no team in 1950, though a Clounmacon team were invited to take part in the Listowel town league competition, they fielded a team and won the final. After this match in 1950 the club was reformed, the Chairman was Jack Murphy, Vice Chairman: Willie Gorman, Secretary: Patsy O'Sullivan, Treasurers: Bill''Donal O'Sullivan and Stephen Enright. Around 1952 the jerseys were, blue with white collars and Clounmacon played in the Ballylongford tournament beating Ballydonoghue in the final. The prize for winning was a set of jerseys which were the colours black and amber, which still remain the colours of the club to the present day. In 1953 they also played in the Ballylongford Carnival Tournament but the tournament was unfinished. 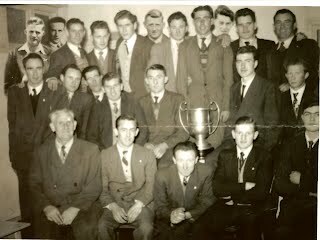 In 1954 which can be described as a glorious year in Clounmacon football, In this year Clounmacon won the North Kerry Senior Championship final beating Tarbert in Tarbert. The victorious team were: Sean Mahony, Martin Scanlon, Tom Costello, Bobby Buckley, Mikie Lyons, Monty Leahy, Paddy Connell, Ger Egan, Joe Scanlon, Bill Phealan, Joe Shanahan, Pat Kerins, Anthony 'Wax' Scanlan, Michael 'Donal' O'Sullivan and Bill Egan, subs: Son Halpin and Brendan Lawlor. In 1955 Clounmacon again reached the North Kerry Senior Championship final, their opponents were Duagh. Duagh won the final by scoring a goal at the final whistle winning the match by two points. In 1956 Clounmacon met Ballylongford in the semi-final of the North Kerry Championship, this game ended in a draw, for the replay both teams were suspended, Duagh were awarded the title. This was said to be the best Clounmacon team ever to play in a final. In 1958 Clounmacon won the Tarbert tournament beating Tarbert in the final. The early 1960's were not very successful, 1964 was the last year Clounmacon played senior, they were after this relegated to the Intermediate ranks, 1965 Clounmacon reached semi-finals in both NK Intermediate league and Championship. In 1966 Clounmacon began on a winning note, they won the Town league competition beating An Gleann in the final, by a score of 2-5 to 0-3. The victorious team were as follows: Patsy Gorman, Michael Daley, Liam Regan (Capt), Paddy Connell, Denis Buckley, Eugene Faley, Mickey Mahony, John Mulvihill, Sean O' Sheehy, Neilly Riordan, Pats Carmody, Joe Riordain, Joe Savage, Billy Fitzgerald and John Walshe. Subs: Patsy Loughnane for John Walshe. Clounmacon reached the Intermediate final beating Duagh on August 19th 1966 on a score-line of 1-6 to 2-1, Paddy Connell holds the record of the longest playing member of the club extending twenty years, he also holds the record of winning two Town league medals senior and intermediate league. In 1967 Clounmacon reached the North Kerry intermediate championship final, but because of a breakout of foot-and mouth in the U.K. The final was postponed until Easter Sunday 1968,Clounmacon beat Tarbert in the final, the score was Clounmacon 2-7 to Tarberts 1-4, Mickey Mahony was the captain. Very little success came Clounmacons way between 1968 and 1984 due to immigration, which affected Clounmacon very badly. Clounmacons Representatives on Senior Kerry teams were Jack and Tom Murphy in the late 1800's and 1900's. John Kennelly in 1909, Paud O'Sullivan in the 1920's, Bob Murphy in 1928, Ger Carmody in 1936, Bobby Buckley in 1953-1954-1955, Patsy Sullivan and Tom Costello in the 1950's,Patsy Sullivan played with Kerry minors in 1952. Clounmacon had representatives in the Shannon Rangers Senior County Championship teams, Jim Carmody played in 1945 and John Mulvihill also won a County Championship medal with Shannon Rangers in 1964. Tim Buckley won a County minor Championship medal with Feale Rangers in 1978 and Denis Paul Curtin and Patrick Shanahan won the same medals in 1979,Tommy Keane won another County minor Championship medal with Feale-Rangers in 1983 also representing Clounmacon.